Today we continue the observance of Tisha B'Av, the ninth day of the Hebrew month of Av, which ends tonight. It's a day of fasting and reading from the Book of Lamentations, which describes the sad state of the Holy Temple and the city of Jerusalem after its destruction in 586 B.C.E. by the Babylonians. At the Kotel (Western Wall) in Jerusalem today, the contrast is striking. 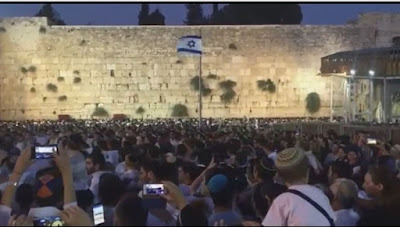 On Tisha B'Av, thousands of residents and visitors find their way to join the throngs who recite Lamentations but also sing songs of hope and prayer. Yesterday we shared the singing of Acheinu, a prayer for our brothers in trouble or in captivity. Today we post a video of a throng at the Kotel singing Ani Ma'amin, Maimonides' thirteen principles of faith. We'll be back tomorrow with more of the usual mix of funny true stories, jokes, music, nostalgia, videos, and whatever's in the news that makes us laugh or smile.